This volume is a sequel to the work I published, several years ago, under the title, Byzantine Constantinople: the Walls of the City, and adjoining Historical Sites. In that work the city was viewed, mainly, as the citadel of the Roman Empire in the East, and the bulwark of civilization for more than a thousand years. But the city of Constantine was not only a mighty fortress. It was, moreover, the centre of a great religious community, which elaborated dogmas, fostered forms of piety, and controlled an ecclesiastical administration that have left a profound impression upon the thought and life of mankind. New Rome was a Holy City. It was crowded with churches, hallowed, it was believed, by the remains of the apostles, prophets, saints, and martyrs of the Catholic Church; shrines at which men gathered to worship, from near and far, as before the gates of heaven. These sanctuaries were, furthermore, constructed and beautified after a fashion which marks a distinct and important period in the history of art, and have much to interest the artist and the architect. 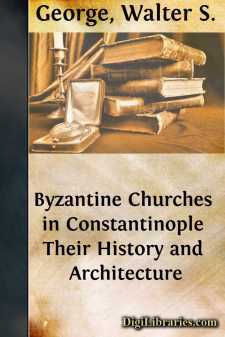 We have, consequently, reasons enough to justify our study of the churches of Byzantine Constantinople. Of the immense number of the churches which once filled the city but a small remnant survives. Earthquakes, fires, pillage, neglect, not to speak of the facility with which a Byzantine structure could be shorn of its glory, have swept the vast majority off the face of the earth, leaving not a rack behind. In most cases even the sites on which they stood cannot be identified. The places which knew them know them no more. Scarcely a score of the old churches of the city are left to us, all with one exception converted into mosques and sadly altered. The visitor must, therefore, be prepared for disappointment. Age is not always a crown of glory; nor does change of ownership and adaptation to different ideas and tastes necessarily conduce to improvement. We are not looking at flowers in their native clime or in full bloom, but at flowers in a herbarium so to speak, or left to wither and decay. As we look upon them we have need of imagination to see in faded colours the graceful forms and brilliant hues which charmed and delighted the eyes of men in other days.